Please contact us prior to the visit. We will need names and car licence plates numbers (if you come by car) in order to get passes for you. You will need to present your passport at the gate. In the GPS, select “Volgogradsky pr 42 k 7” please note the difference in the k number! Pass through Gate 4, turn right, drive till the end (Sector E). Enter the gray door, go to the uppermost, Mapper entrance will be at your right. By metro or suburban train go to “Tekstilshiki” station, exit in the direction of the center, number 8. 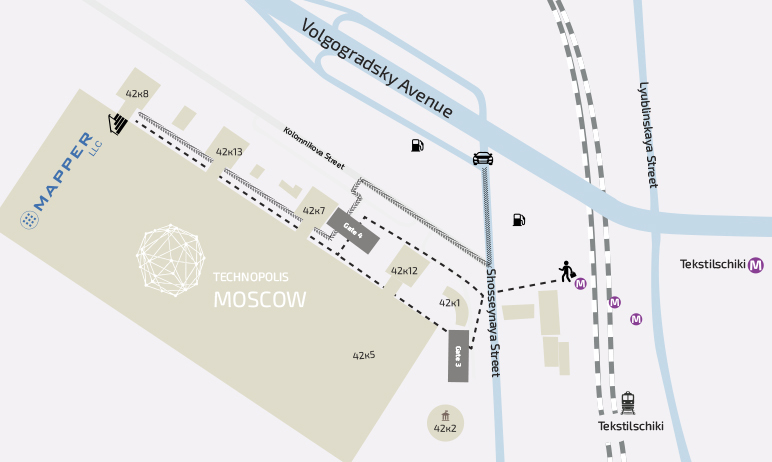 Pass under Shosseynaya street and than go to gate 3 or 4, keep right, go until the end. Enter the gray door; go to the top store, Mapper entrance will be at your right.